Time: no more than 12 minutes! 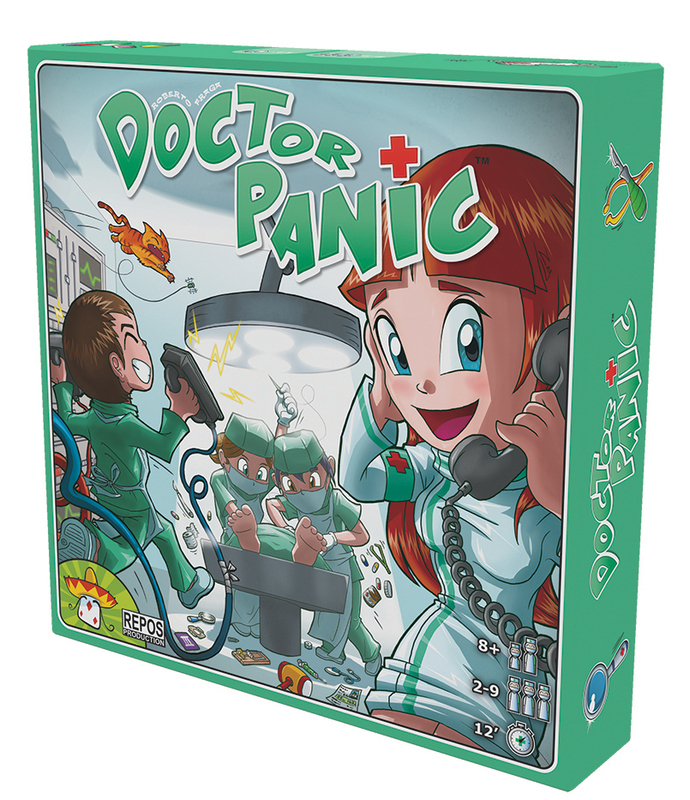 Doctor Panic is one of those interesting games that will likely have few opportunities to hit the table, but will provide raucous fun when it does come out. 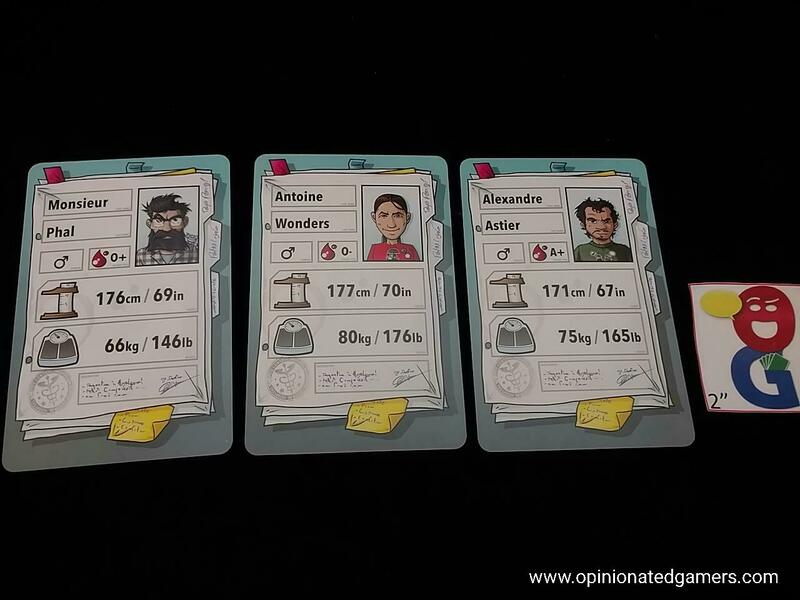 In this cooperative game, players split themselves up into teams to save the patient on the table. Teams are made up of 2 or 3 players, and each team gets ready for the game by taking a card from each of the eight test decks. These 8 cards are then shuffled and placed face-down in front of the team. All of the varied equipment is laid out on the table where everyone can reach them. Someone has hopefully already downloaded the smartphone app for the game – or has loaded up REPOS’ website where the soundtrack can be found. There are a few varying levels of difficulty in the soundtracks, so you can set the level of the challenge before you start. 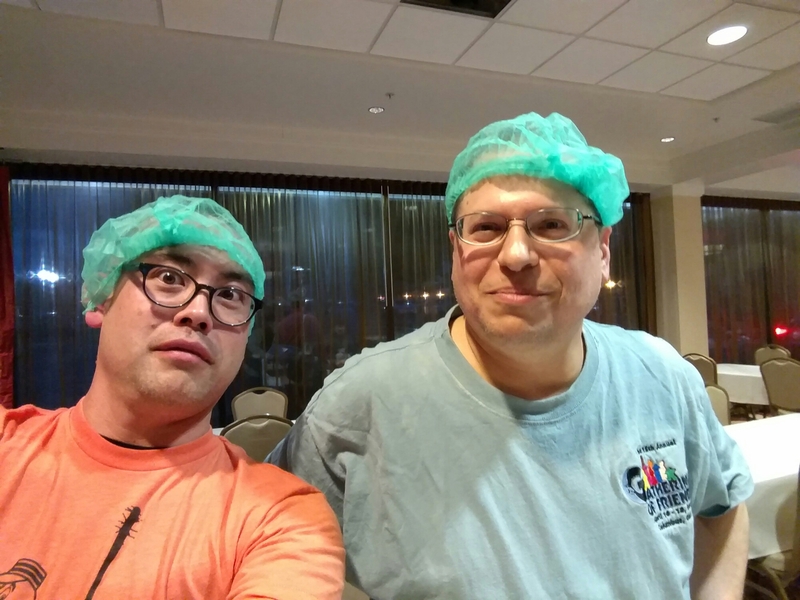 While this is happening, all players can get into the theme of the game by putting on the green hair nets and preparing themselves for surgery. The core idea of the game is simple – in the time limit provided by the soundtrack, all the teams need to complete their entire deck of challenges. 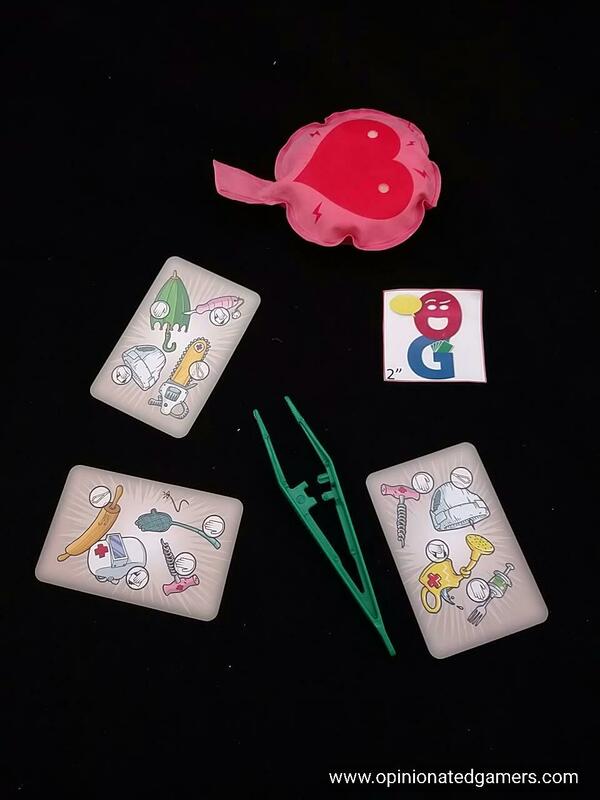 There are a few interruptions which will make the task more difficult – but first let’s consider the 8 medical procedures… For each of the tests, only one player on a team is allowed to look at the card, the other members of the team can only follow the directions as dictated by the player holding the card. Magnifying glass – one player holds a magnifying glass to his body. The reader then directs the magnifying glass to seven different locations on the body. The glass must always be in contact with the other player as it travels. X-Ray test – the card has two silhouettes. The reader directs the other player to move various parts of his body in order to mimic the picture on the card. One picture is always head on and the other is a sideways profile. Injection test – the patient card has both height, weight and blood type. 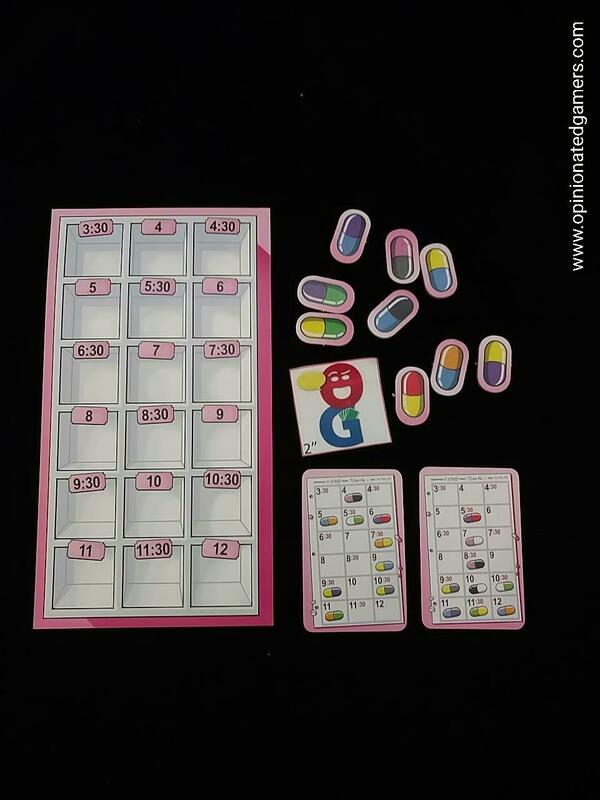 The injection card tells you which criteria to use – and the correct dose of a particular medicine has be found on a chart. Cards are lined up on the table to show the injection. Electrodes test – there are 8 different shapes used on the body board. You have to place the right shape on the right location on the body. Sounds pretty easy so far, right? Well, sure – these tasks are fairly straightforward. The catch is that most of them can only be performed by one team at a time, so sometimes have to juggle the order in which you do things. Furthermore, the forceps are used for a number of different tests, so you have to also figure out how to share those amongst the teams. But – that’s not all. There are also two programmed interruptions that you have to deal with when the soundtrack alerts you. First, cardiac arrest! If you hear a flatline (high pitched single tone) – that means that your patient has gone into arrest. All players have to stop what they’re doing until the arrest is done. One player needs to find the heart whoopee cushion and start doing CPR on it. Meanwhile, one player looks at the smartphone and reads out a four or five digit code on the screen. The other players have to use number cards to match the sequence to charge the defibrillator. Once the code is correct, all players say “Clear!” and lift their hands from the table. Then, in unison, they slap the table together and yell “Shock!”. It’s actually important to do it together and do it loudly because the app senses both the volume of the yell as well as the vibration of the table slap to determine whether the rescue attempt is successful. If the normal soundtrack resumes, teams can go back to trying to solve whatever test they were on. If you still hear a flatline, you have to do another code/clear/table slap. Second, the boss might call on the phone. When this happens, a player reads the message on the phone – which is usually some sort of whimsical instruction – and no tests can be resumed until the requested action is completed. In our last game, we were asked to take a photo and post it on a social media site before we were allowed to continue. You simply hit a button on the phone to tell the app that you’ve done the requested task. 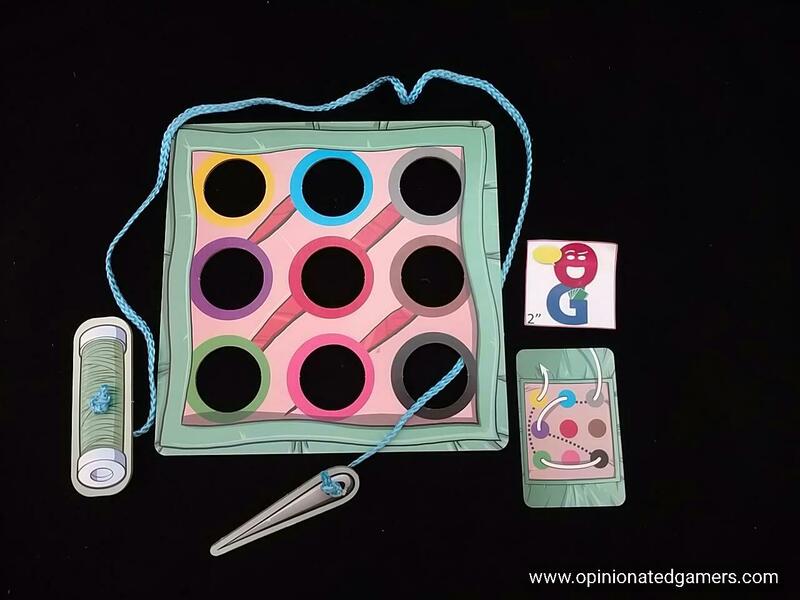 Fraga really likes this style of game – this is at least the third take on it from my recollection (Pingo Pingo last year, Squad Seven in the remote past) – as well as the upcoming Captain Sonar later this year from Asmodee… They’re not my favorite type of game as I’m not a fan of the chaos – but… my games at the Gathering of Friends were filled with laughs, frenzied activity around the table, and a sense of never really knowing how the team was doing until the end. In that sort of setting – at a large game convention, played with large groups of friends, possibly under the influence of nice drinks with dinner – this game is sure to be a hit. We had a lot of fun running around, doing the tests, etc. It also served to be a fairly funny after dinner show for all the people who ended up being attracted by all the noise to come watch. The app makes things super easy to do – and as apps are often going to update in the background – I assume that new features and new boss instructions will eventually appear in the app. I think that it’s ingenious to have the app note both the vibration and the yelling on the flatline. It also makes the administration of the game seamless because the phone can sit on the table where everyone can hear it and it can be easily referenced for the interruptions. 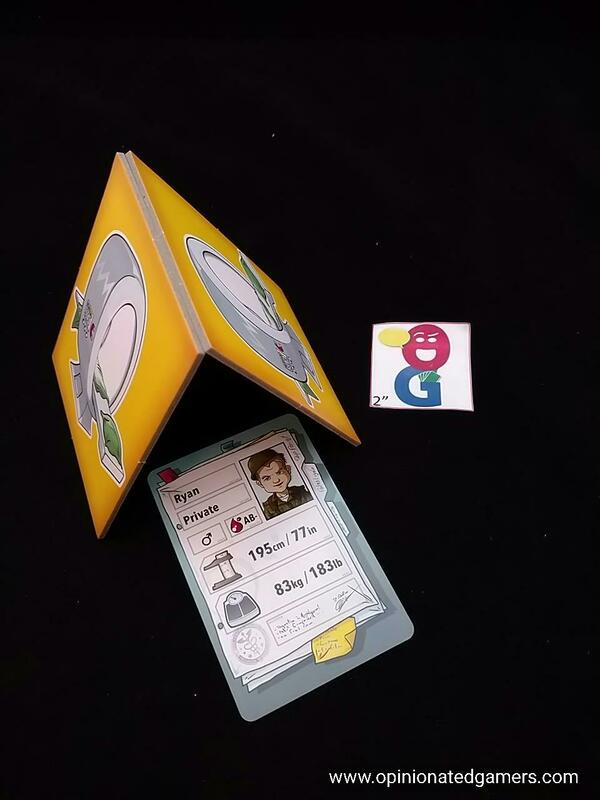 The individual tests vary in difficulty, and we actually found the most difficult one to be the scanner – mostly because a lot of people had a hard time propping up the two cardboard pieces where they would stand. Perhaps the addition of a small non-skid mat would help when playing on a slick table. Posing for the x-rays was easy to accomplish, once you could get everyone to stop laughing long enough to give and receive the directions. I like the way the game forces communications between the members of a team as well as some communications within the whole group when trying to figure out if the components like the tweezers could be shared. We had a wonderful time with this at the convention, but I’m not sure how well it will go over with the regular group at home. First, we’re usually only 4 players, and this game seems like it would play much better with a full complement of players to increase the frenzied confusion and scarcity of resources. Second, it’s not really the sort of game that my group would play anyways. Another REPOS title that doesn’t suit my group is Cash’N’Guns. That’s not to say that either is bad – it’s just not the right game for that group. Given the reception that it had at the Gathering, I’ll certainly keep it around to tote with me to the conventions and invitational events that I go to. It’s definitely the sort of game that can provide a great group experience on several occasions a year, but not the game that will get played three weeks in a row (at least not in my house). Dan Blum (1 play): It does a decent job of being a silly game, but it’s not the kind of silly game I prefer (something like Celebrities is more to my taste). And it has minor issues – Dale mentions the “hard” time we had getting the “scanner” to stay up, which I would have characterized as “impossible” on a table with a smooth surface. (We eventually resorted to propping it up.) These don’t ruin the game but they make it less fun, and this game has nothing to offer but silly fun. This was really helpful as my gaming group tends to really dig chaos type games (or screamers as we call them) when they are short and even a bit silly. The reason is that after a 2 hour slog through dead of winter in which i again died these game types tend to bring a quick burst of energy into the room and allow a quick mental cleanse. I was unsure about it at first glance but since hearing the detailed touches like the slaping the table and the phone sensing it I am now impressed I think this game just got onto the play it list.